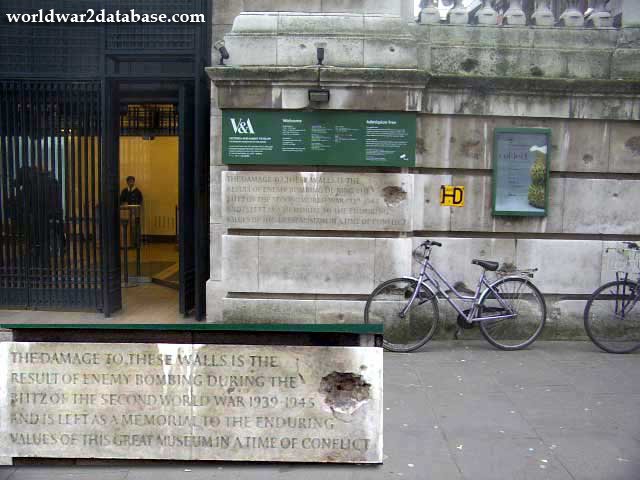 Close-up of plaque created by David Kindersley in 1985 to commemorate the bombing of the Victoria and Albert Museum. The plaque is chiseled directly into the Aston Webb Facade, and incorporates part of the damage from a double bomb explosion that seriously damaged the Victoria & Albert, blowing in the doors. At the time the doors were the only public access. The Museum closed for several days while the galleries were exposed to the elements. Many items in the collection were evacuated in August 1939, minimizing the damage.